After countless hours spent removing glitter from the nails of holiday parties past, you’re ready to transition to something a little cleaner and easier. While fancy nail art and polish trends are always fun to try out (and we’ll cover that eventually), we’re happy to rely on our basic polishes to get us through the rest of winter. This time of year we tend to gravitate towards the deeper, richer colors of our collection. 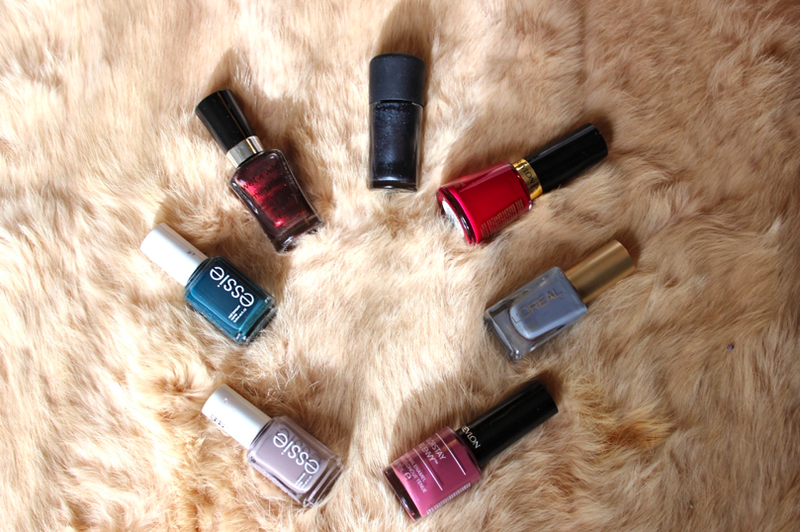 We’ve come up with our most frequently used polishes this time of year, though because we’re beauty addicts, we couldn’t limit ourselves to fewer than 7. MAC Nail Lacquer Polish in Nightfall – this near-black polish has the perfect amount of gray to keep it wearable, but still a noticeable departure from the reds you rocked all December. Revlon Nail Enamel in Bewitching – This creamy burgundy is like a good wine, always there when you’re not sure what else to do. L’Oreal Color Riche in Grecian Goddess – The L’Oreal polishes may be our favorite drugstore option. The brushes are so easy to work with and the colors glide on in 2 easy coats. We’re loving this blue-gray. Revlon ColorStay Gel Envy in Hold Em – This color is hinting at flowers blooming, temperatures rising and sun returning to the sky. It makes us smile when we look down and see it amidst all of our current layers. Essie in Chinchilly – This was the color of fall a few years ago, but we love it year-round. It’s the perfect gray with a little bit of blue and a little bit of purple, so you can totally justify buying it because it looks nothing like the five other grays you have. Essie in Mind Your Mittens – The cool girl color. It’s that perfect friend who’s rolled out of bed looking that good and doesn’t even know it. This color stands out in a way that’s really interesting, but never tries too hard. Out of all our picks, this is hands down the most unique. Wet n Wild MegaLast in Under Your Spell – Not only will this polish only set you back about $2, it’s actually another drugstore fave for applicator and formula. The entire ‘MegaLast’ range is great, but we love ‘Under Your Spell’ for the so-deep-red-it’s-almost-black-look. You know, to really shake up our all black ensemble. So, did we miss any? What are your favorites for winter 2015 that we just HAVE to add to our collection?